For folk / Americana / Roots music, Molly Malone's will be THE place to be in LA on May 18th. Bring a friend ... medicate with whatever brew you use and join the music magick. Molly Malone’s Irish Pub is brewing up a powerful potion of folk music medicine that feeds the mind, heals the soul and makes the body want to dance! 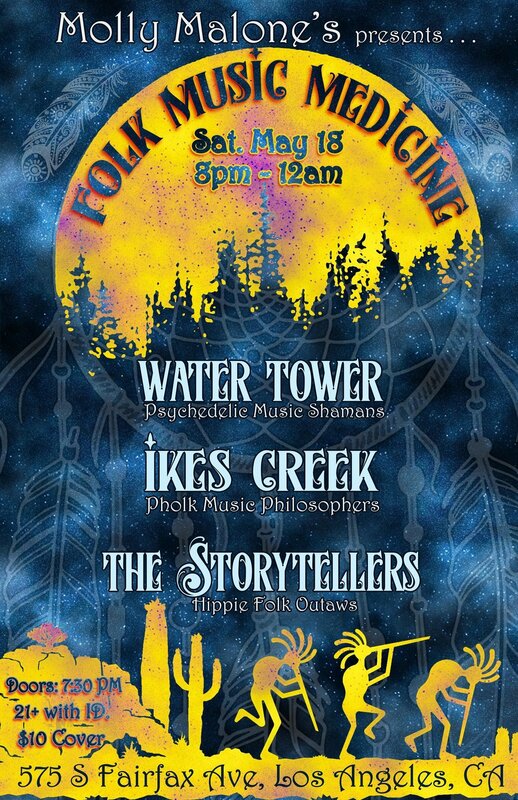 Featuring psychedelic folk music shamans Water Tower; the pholk philosophers and “Best Band” at Topanga Folk Festival, Ikes Creek; and the good-time, harmony-singing, hippie folk outlaws, The Storytellers.